This image depicts the "Imperial Coronation Egg," created by the House of Fabergé for the Russian Imperial Family, in 1897. It is currently owned by Viktor Vekselberg, a wealthy Russian industrialist, who is trying to regroup as many of the 43 surviving eggs as possible into a single collection. The object has been displayed at the Vatican. In the 19th century, many Russians viewed Easter as a time to give gifts to friends and family. Celebrating Easter, in the East, was like celebrating Christmas in the West. Orthodox Russians, over the centuries, had developed another Easter-time tradition. People brought hand-colored eggs to church, where they could be blessed before they were given-away as gifts. Wealthy Russians gave Easter eggs as gifts, too, but those presents were far more elaborate than colored eggs. The Imperial Family—that is, the Tsar and his family members—were no exception to these traditions. What was exceptional, however, was the type of gift that the Tsar—also a member of the Russian Orthodox Church—could afford to give. In 1885, Alexander III was Tsar of the Russian Empire. It was a special year for him and his wife—the Empress Marie Fedorovna (who had grown-up in Denmark)—because it marked twenty years since they had become engaged. The Tsar wanted to give his wife a special gift. Alexander didn’t want to purchase something “off the shelf” for his wife. He wanted an artist to create something really awesome for her. To commission this special gift, the Tsar turned to Peter Carl Fabergé—a Russian artist, born in St. Petersburg—who was known for crafting beautiful objects incorporating gorgeous jewels. Because the special present would be an Easter gift, the Tsar had two ideas in mind. He wanted Fabergé to create not only an object which marked the occasion but which would also have special meaning for Marie. As a child, Marie had especially loved an egg owned by her aunt—Princess Wilhelmine Marie of Denmark. Could Fabergé create a special egg for Maria? The result, of this collaboration between the Tsar and the artist, ultimately led to a series of Fabergé eggs—50 in all—which Fabergé’s company (known as the House of Fabergé) created for the Russian Imperial Family. ...it is crafted from gold, its opaque white enameled “shell” opening to reveal its first surprise, a matt yellow gold yolk. This in turn opens to reveal a multi-colored, superbly chased gold hen that also opens. Originally, this contained a minute diamond replica of the Imperial Crown from which a small ruby pendant egg was suspended. Unfortunately these last two surprises have been lost. 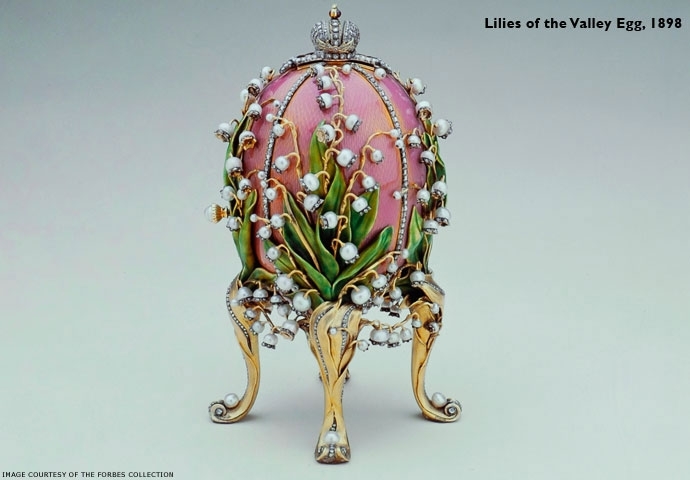 The Empress’s delight at this intriguing gift with its hidden jeweled surprises was the starting point for the yearly Imperial tradition that continued for 32 years until 1917 and produced the most opulent and captivating Easter gifts the world has ever seen. The eggs were private and personal gifts. How long did it take for the Fabergé artisans to create these works of art? Each egg, an artistic tour de force, took a year or more to make, involving a team of highly skilled craftsmen, who worked in the greatest secrecy. From 1887 Fabergé was given complete freedom in the design and execution, with the only prerequisite being that there had to be [a] surprise within each creation. Dreaming up each complex concept, Fabergé often drew on family ties, events in Imperial Court life, or the milestones and achievements of the Romanov dynasty, as in the Fifteenth Anniversary Egg of 1911, commemorating the fifteenth anniversary of Nicholas II’s accession to the throne, or the Romanov Tercentenary Egg of 1913 that celebrated 300 years of the House of Romanov. Were the artisans able to create a surprise for each special egg? Although the theme of the Easter eggs changed annually, the element of surprise remained a constant link between them. The surprises ranged from a perfect miniature replica of the Coronation carriage - that took 15 months to make working 16-hour days - through a mechanical swan and an ivory elephant, to a heart-shaped frame on an easel with 11 miniature portraits of members of the Imperial family. Alexander III presented an egg each year to his wife the Empress Marie Fedorovna and the tradition was continued, from 1895, by his son Nicholas II who presented an egg annually to both his wife the Empress Alexandra Fedorovna and to his mother the Dowager Empress Marie Fedorovna. However, there were no presentations during 1904 and 1905 because of political unrest and the Russo-Japanese War. Of all the eggs which the House of Fabergé created for Russia’s Imperial Family, which was the most-expensive? 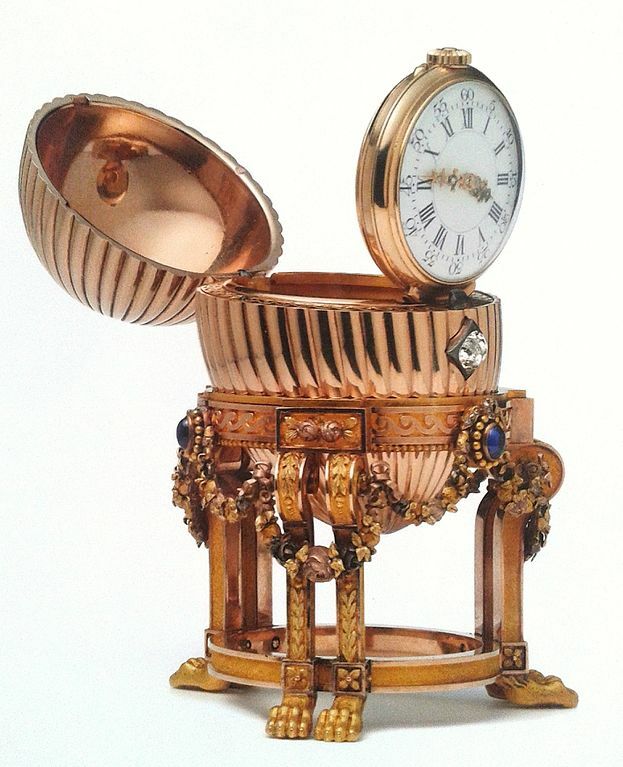 One of the most expensive was the 1913 Winter Egg, which was invoiced at 24,600 roubles (then £2,460)...Using this yardstick, the egg would have cost £2.36 million [$3,355,684] in today’s money. The Winter Egg, designed by Alma Pihl, famed for her series of diamond snowflakes, is made of carved rock crystal as thin as glass. This is embellished with engraving, and ornamented with platinum and diamonds, to resemble frost. The egg rests on a rock-crystal base designed as a block of melting ice. Its surprise is a magnificent and platinum basket of exuberant wood anemones. The flowers are made from white quartz, nephrite, gold and demantoid garnets and they emerge from moss made of green gold. Its overall height is 14.2cm. It is set with 3,246 diamonds. The egg sold at Christie’s in New York, in 2002, for US$9.6 million. More recently, someone browsing at a flea market, looking for items to turn into scrap-gold, saw an interesting object at an antique stall. Purchasing the item—for $14,000—he tried to sell it to gold-scrap dealers for not-much more than he’d paid for it. The dealers thought his price—$15,000—was too high. As the years passed, the owner kept the object—a pretty egg—in his kitchen. One night, in 2014, he did a bit of exploring on his own. He’d found the name “Vacheron Constantin” etched inside the egg. What did it mean? Investigating online, via Google, the egg’s owner found an article published by The Telegraph on August 13, 2011. 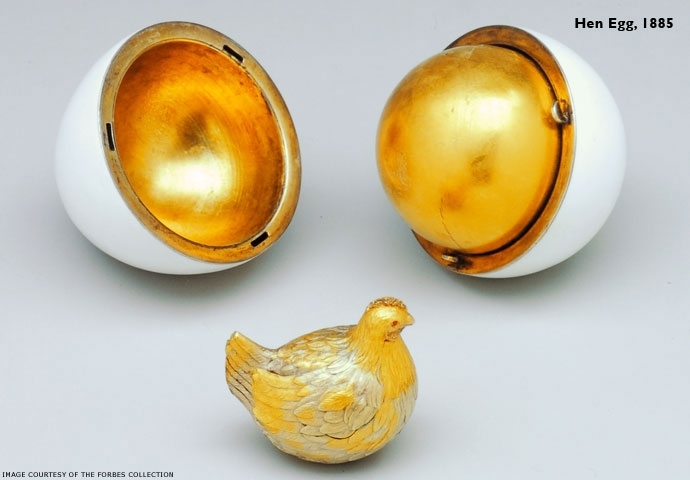 Discussing a “lost egg,” which Tsar Alexander III had given to his wife as a gift in 1887, were two eye-catching bits of information. One bit of information was a picture which looked exactly like the egg sitting in the current-owner’s kitchen. ...whoever has this piece will have no idea of its provenance and significance – nor will they know they are sitting on a royal relic which could be worth £20 million [the equivalent of $28,460,300]. He brought pictures of the egg and I knew instantaneously that was it. I was flabbergasted – it was like being Indiana Jones and finding the Lost Ark. It was a very modest home in the Mid West, next to a highway and a Dunkin’ Donuts. There was the egg, next to some cupcakes on the kitchen counter. I examined it and said, “You have an Imperial Fabergé Easter Egg.” And he practically fainted. He literally fell to the floor in astonishment. The lost egg ended-up in the hands of a collector—who reportedly paid $33 million for it—and the unidentified gold-buying dealer remains unidentified. Of the 50 imperial Easter eggs, 43 are accounted-for. Click on the top image for a better view. Bos, Carole "Awesome Easter Eggs - Faberge Eggs" AwesomeStories.com. Mar 22, 2016. Apr 21, 2019.